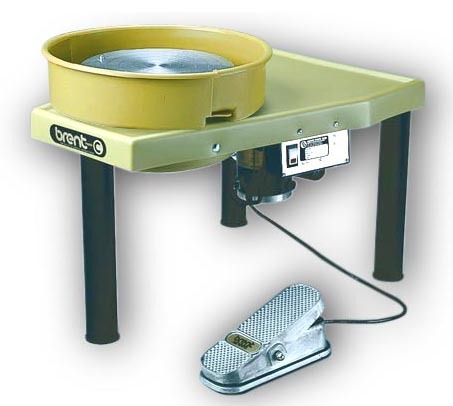 Brent Potter’s Wheel, Model C is ideal for Art Centers and schools. Includes Brent Classic Controller for Optimal Torque at ALL Speeds, Smooth Response, Quiet Operation & more!! Tough 3/4 HP, 7 amp motor. Centers 225 lbs. of clay. 14" diameter Wheel Head is cast & machined aluminum with 2 removable bat pins and is marked with concentric circles for ease in centering clay. 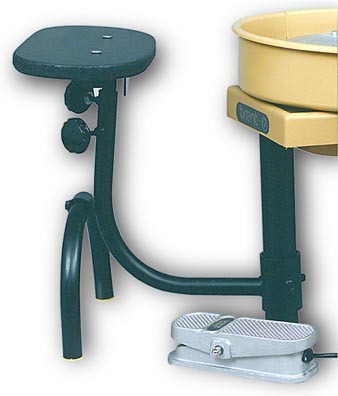 Includes FREE 14" Past-i-Bat with holes, a Poly Splash Pan and 8-Groove Poly-V Drive Belt. Approx. Shipping wt. 117 lbs. Comes with 10 Year Limited Warranty through a nationwide service network. Includes Instructional DVD "How To Throw On A Potter’s Wheel"
IMPORTANT: CAN ONLY BE SHIPPED IN THE CONTIGUOUS U.S. EXPEDITED SHIPPING is NOT AVAILABLE for these items. IMPORTANT: CAN ONLY BE SHIPPED IN THE CONIGUOUS U.S. This Potter's Wheel is drop-shipped via TRUCK from the factory in Indianapolis, IND. Cannot ship potter's wheel via UPS. Shipping charges will be added to your order. Based on present rates shipping charges may range from $75 to $150 depending on your distance from the factory. For EXACT Shipping Cost to your location please call us. Please allow approximately 3 weeks shipping from time your order is processed.